Today marks the start of Month of Photography Los Angeles. While there are many great events on this year’s calendar, one in particular caught the attention of AtEdge photographer rep Marilyn Cadenbach. The Stand-Ins, curated by Amy Feitelberg, Photo Director at Los Angeles Magazine, brings to light the often unseen photos of a photographer’s stand-ins. We’ve all been on set when someone, most often an assistant, is asked to stand in while the photographer shoots a couple of frames to check camera angle, lighting, focus, etc. 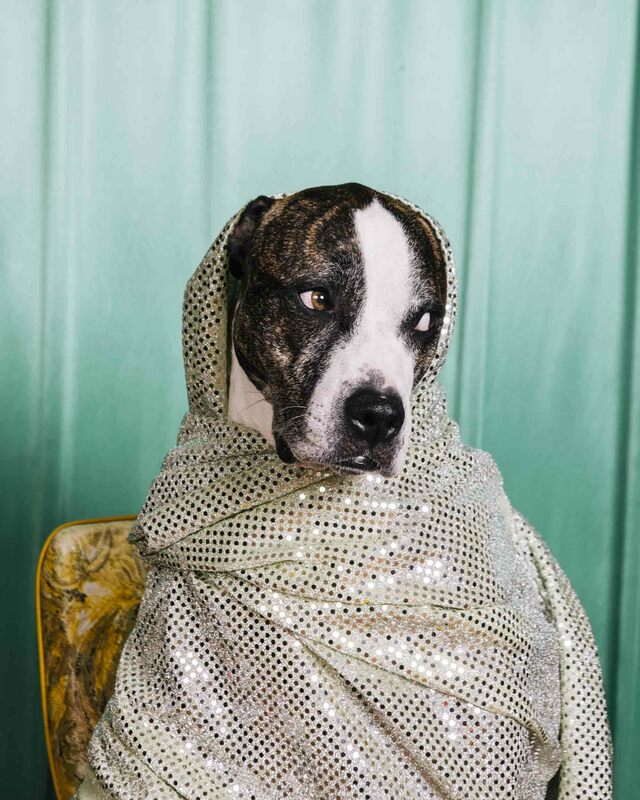 These images generally don’t make it beyond the photographer’s archive, even though they may very well hold up on their own as beautiful, or even comical work (as seen above in Emily Berl’s image of her dog standing in for an adult film star). How long has The Stand-Ins been in the works? I feel like I’ve been thinking about it forever, but I guess I pitched it to Cat Jimenez, Executive Director at Lucie Foundation, in the Fall. I saw Cat at an event, and we had never actually met. I went up to her, introduced myself and pitched her my idea. She said she loved it, and then next I knew, it was a show. I guess I really started working on it at the very beginning of 2015 though. How did you get everyone to agree? You’ve mentioned that you have no real favorite photo in this exhibit, but which photographer was the most exciting yes? I sent out a big email to people I love and work with on a regular basis, told them the premise of the show and asked them to submit. The response was overwhelming. So many artists sent in work. It was a huge task to narrow down the submissions. I wish I could have included everyone. The response was 100% positive. Everyone thought it was a great idea! As a Photo Editor you see so much, what makes a project good to you? I do see a ton of images — and so many of them inspire me. A good project to me is an original take on something. We all know that pretty much everything has been shot, but that doesn’t mean there isn’t always a new way to look at something. To reinterpret it for the modern era. I also love work that feels personal and honest – gets me every time. How does it feel to curate a show compared to a magazine? What was that experience like? Well it’s a lot different than curating a magazine. I’m so used to a set formula, and I know how things are going to fit and snap together in a magazine. I also have a lot of people I collaborate with where I work. With a show, all the decisions were pretty much mine. What the final pieces would be, how they would be hung, the promotion and marketing of the show. Of course Lucie Foundation has a huge hand in getting the word out. I’m just used to a physical product hitting the grocery store every month. There were a lot of logistics I never thought about. You’ve worked in two major cities for photography in the US (LA and NY), any major differences? Oh boy, that’s a big question. New York of course is so centralized. It makes some things easier, and the photo community is so strong there. Here, life is easy, and you can shoot year round, because the weather is always great. We’re spoiled in a lot of ways, but it’s harder to see people, harder to be a part of each others’ lives and work because of the vastness of the city. But I have to say I love New York, and I love Los Angeles. I feel lucky that I have gotten to work in such amazing cities with fantastically creative people. LA is such an industry town, but there is still so much mystery and closeting of the production. What do you want to share by showing these images? I just think that people never know how hard it is to do something. Because of phones and the digital age, everyone thinks they’re a photographer. The artists I work with pour everything into what they do. To light, compose, conceptualize and build an image takes vision and a team of people. I think this show, while funny and whimsical, also shows how high-end pictures are made. Do you feel a stand-in disrupts the image that was intended, demystifies it, or does it becomes its own entity? The images I picked for this really highlight the images becoming their own entity. Most of these are photos that stand totally on their own as just great images. And some of the stand-in images are better than the final product! Don’t miss The Stand-Ins, opening April 2 from 6-9pm at The Icon. This post originally appeared Marilyn Cadenbach’s blog.